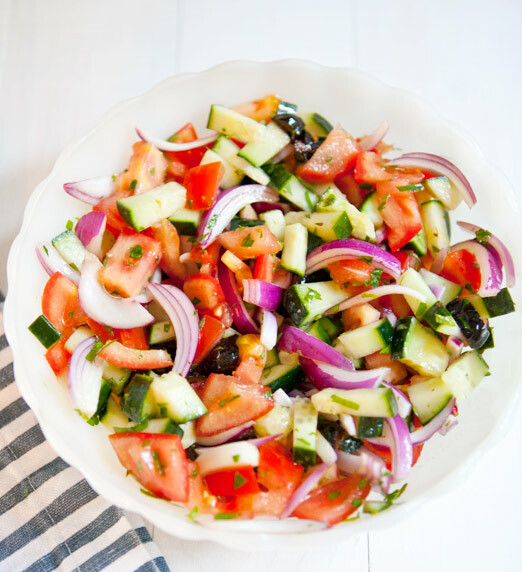 this salad is light, easy, healthy and absolutely perfect to eat all spring and summer long. i love adding it to this plate for a complete meal. and, i am very proud to say, the parsley in this came from my herb garden. it was the first time i’ve “harvested” and it was so satisfying to just wander into the back yard and pick my own herbs. i am mildly impressed with myself for that one. i do have to tell you, i feel funny writing out instructions for how to make this because it’s just so simple and i usually just throw it together with no rhyme or reason. but here goes! chop all veggies and combine with parsley, mint and olives. for the dressing: in a seperate bowl mix olive oil, red wine vinegar & lemon juice. add 3/4 of dressing to the salad and mix well. season with sea salt to taste. enjoy! 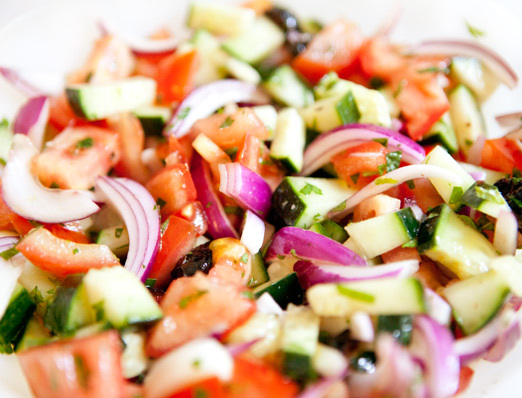 This salad smells Greece at all! We call it "horiatiki" (means from village) and is delicious, indeed!